Dexter Daily: Executive Producer Sara Colleton: "Deb Holds a Mirror to Dexter of the Self He Wants Reflected"
Executive Producer Sara Colleton: "Deb Holds a Mirror to Dexter of the Self He Wants Reflected"
via THR: During Sunday's Dexter, Miami's best serial killer discovers that Dr. Evelyn Vogel is his puppet master -- the woman who helped his father, Harry, create the code by which his Dark Passenger lives free from jail, effectively saving his life. 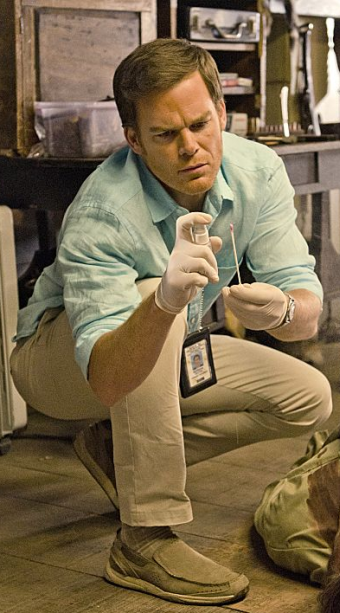 Vogel uses a taped session with Harry to explain how Dexter functions -- and that she used other unorthodox methods to help other serial killers co-exist in society. The problem: The Brain Surgeon could be one of her former patients and wants to take a scoop out of the renowned doc's own brain. In another video, Harry learns that he has an innate sense of justice -- giving his father an early vote of confidence that helped him cope with his son's true self. The video, Dexter realizes, is an attempt for Vogel to call in a favor from him -- only Dex doesn't trust Vogel, ultimately holding him responsible for the damage he has done to Deb. "It will be an interesting evolvement of [Dexter and Vogel's] relationship and quite a wonderful one because Dexter has never had a mother," executive producer Sara Colleton tells The Hollywood Reporter. "At 3 years old, his birth mother was murdered and he sat in her blood for days. And Doris, Harry's wife, was sick with cancer and died when Dex was a boy. So someone who accepts him completely and is as intelligent and insightful as Vogel, it's very helpful to Dexter this year." Read the rest of the article, after the jump. While Vogel fears that The Brain Surgeon is turning from the program she created for him, she reinforces (multiple times) that Dexter is a "perfect" creation, Dark Passenger and all. "When Vogel says, 'You're perfect,' Dexter is at his lowest point ever in the history of the series -- it's right up there with losing Rita because he lost her but still had Debra as his North Star but now he doesn't have that," Colleton says. "As Dexter says in the pilot, 'If I could have feelings for anyone, it would be for my foul-mouthed sister, Debra.' She's always been his compass and she's missing. Even though Vogel is a trained neuropsychiatrist and very adept at manipulating people, Dexter can be roped into her deeds because he needs to hear this, and she's got an agenda and has come back because she needs his help." It comes just as Dexter learns that Deb is making things worse for herself, having put a bullet in El Sapo. It's the first kill that comes as Deb is seemingly developing her own rules of the law as a PI when she confesses that he got what he deserved. It also marks the rare instance when Dexter is forced to destroy evidence connecting his foster sister to a murder -- one in which Deb is still struggling with. It creates an interesting dynamic for Dexter with Vogel. With the latter having created the code, she believes Dexter is truly incapable of love and realizes that he has already broken the first rule of his own code once he allows Deb -- who learned of his true identity -- to survive. "It's a very interesting episode when this comes up. Vogel being a scientist says, 'Why didn't you kill Deb?' She brings it up and finds it very interesting," Colleton says. "Deb holds a mirror to Dexter of the self that he wants reflected. It's a very human thing, and it's brought up in a way that allows Dexter to explore, analyze and pull apart his relationship with Deb."